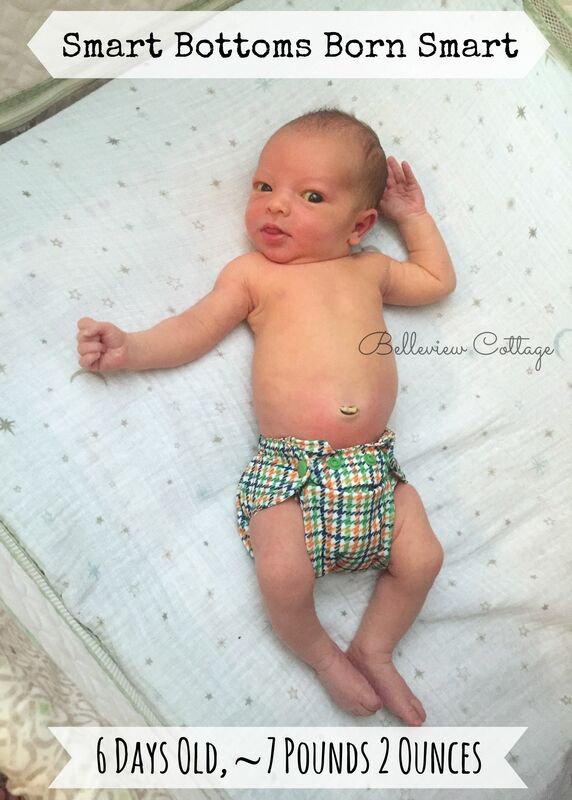 I started cloth diapering my first son when he was around 10 months old. I purchased one-size cloth diapers. They have snaps down the front of the diaper (or, in the case of Bottombumpers, in the back of the diaper) — called “rise snaps” — that adjust the diaper to fit different sizes as your child grows. Baby #2 was born a few months ago, and since I am a cloth diaper addict, of course this baby has been wearing cloth from the get-go! I purchased a number of different “newborn” diapers to try out on this baby. 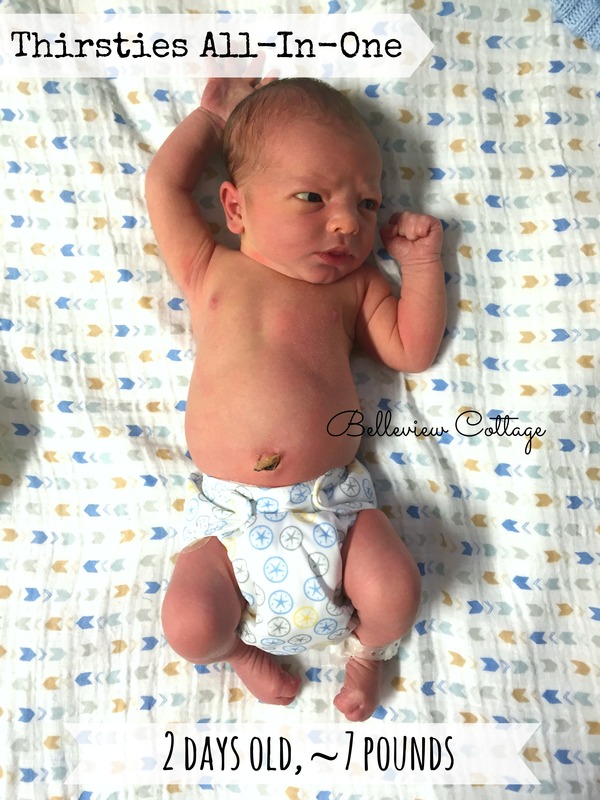 This is a detailed review of all the newborn diapers we have tried. This is our cloth diaper model and tester, Baby C #2. He was born at 41 weeks gestation, weighing 7 pounds 8.8 ounces, and measuring 21 inches long. 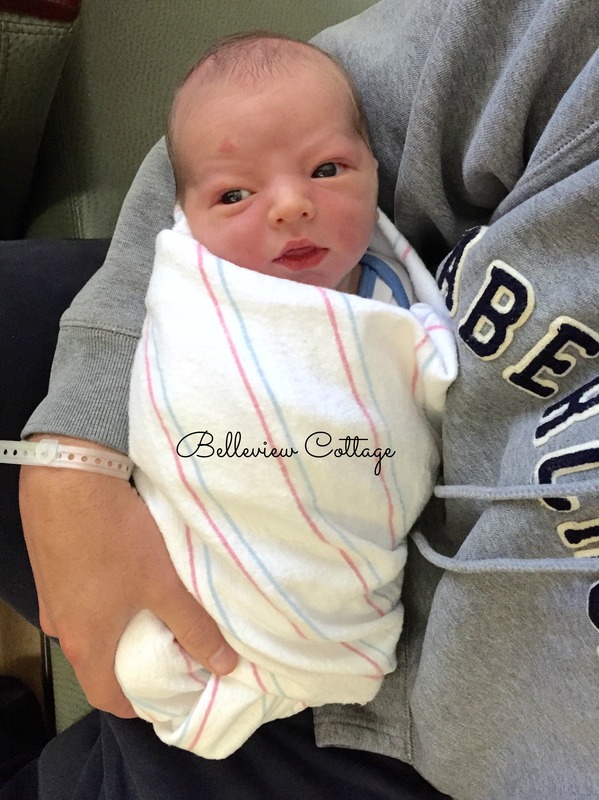 [Side note: if you have an interest in birth stories and/or essential oils, check out this post about his birth.] I put his first newborn cloth diaper on him as we were preparing to leave the hospital, when he was still under 48 hours old. His weight had dropped to around 7 pounds at this point. Neat fact: the meconium bowel movements (dark and sticky poo that newborns pass for the first few days of their lives) DID NOT stain the cloth diapers! 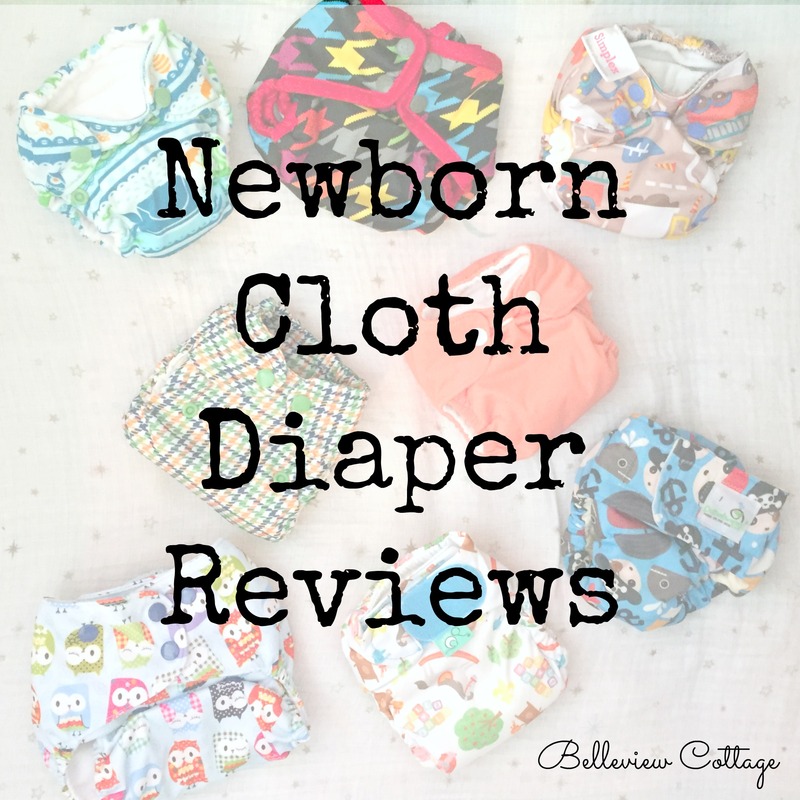 Without further ado, here are the cloth diaper reviews! After reading this post, feel free to chime in with your opinions of newborn diapers in the comments! I’d love to answer any questions you have as well. Bottom Line: I might recommend the Lil Joey to anyone who has a preemie or an otherwise very tiny baby. 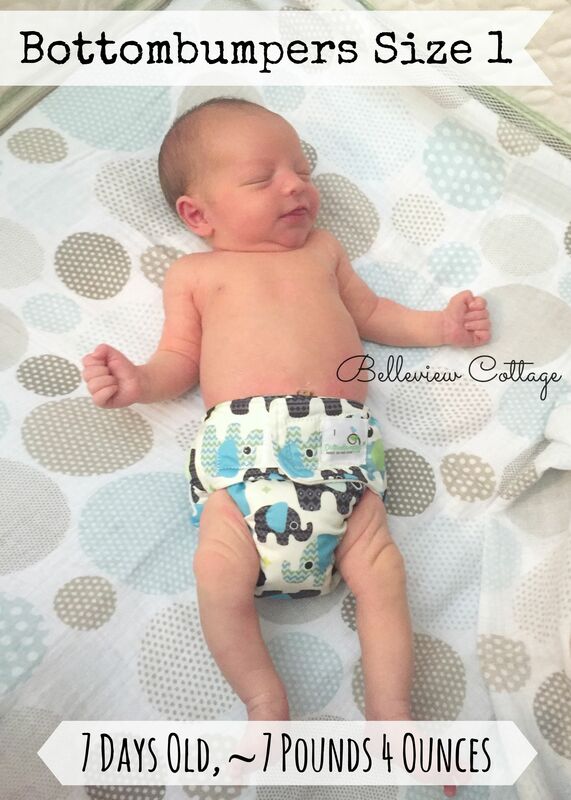 Rather than purchasing them, however, consider trying a newborn cloth diaper rental. I do not recommend buying a stash of Lil Joeys for an average-sized baby who will likely outgrow the absorbency in the first month or so. The Thirsties diaper (below) is a better option in this price range, if you are looking for an all-in-one. I liked this newborn diaper. It is very trim and fits great under newborn onesies. The adjustable rise snaps also help to get a perfect fit. The organic cotton inner was plenty absorbent in the beginning, but by one month old, my son was already outgrowing the absorbency. I tried removing the snap-in soaker, folded it in half, and placed it in the front of the diaper (the wet zone for boys). Unfortunately, my “super-soaker” son still peed through this diaper in record time. By 2.5 months old, my son has developed cute chunk baby thighs and the Born Smart barely fits. We are retiring this diaper from our newborn stash. Bottom Line: I wanted to love the Born Smart. But, sadly, I would not recommend it over the other diapers in this price range, due to lack of absorbency past one month old. I also have a preference for newborn diapers that come with an aplix option (for easy middle-of-the-night changes). 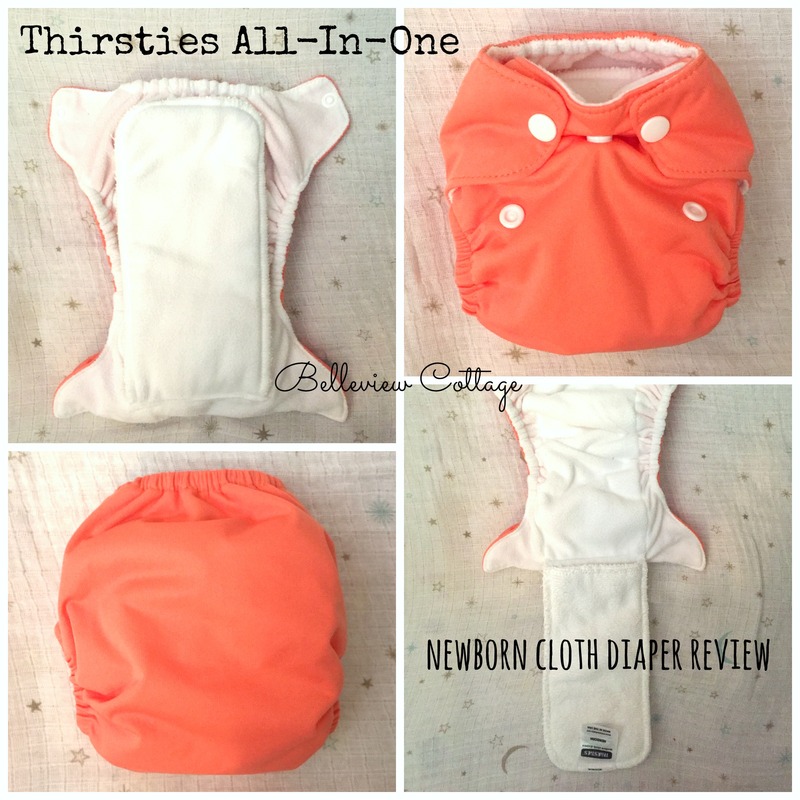 I really liked the Thirsties newborn diaper. The picture to the left is the very first cloth diaper I put on my son, at the hospital. The diaper actually appears bulkier in the crotch than it should be, because I forgot to snap the rise snaps to make it smaller. With all of the above-listed positive features, and at this price, this is a great newborn option. My son (the super soaker) is outgrowing the absorbency, however. At three weeks old, he could wear this diaper for an hour to an-hour-and-a-half. I cannot put it on him for a long nap or during the night. At 2.5 months old, the diaper still fits, but I only put it on him for short periods of time because there isn’t much absorbency compared to our other diapers. Bottom Line: I would recommend this diaper to anyone looking for a newborn all-in-one in the $15 price range. But beware; if you have a heavy wetter, your child will likely outgrow the absorbency or will require frequent diaper changes in this diaper. 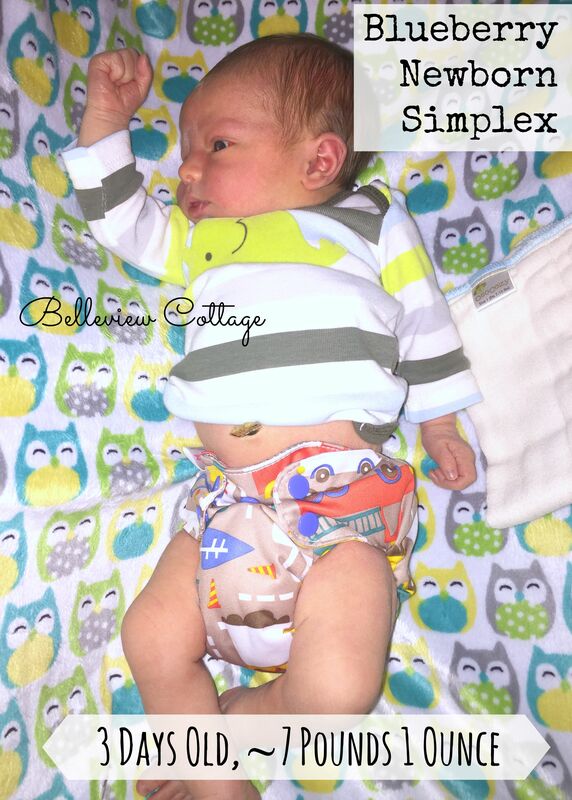 The Blueberry Simplex newborn diaper has great features, and hardly any drawbacks. 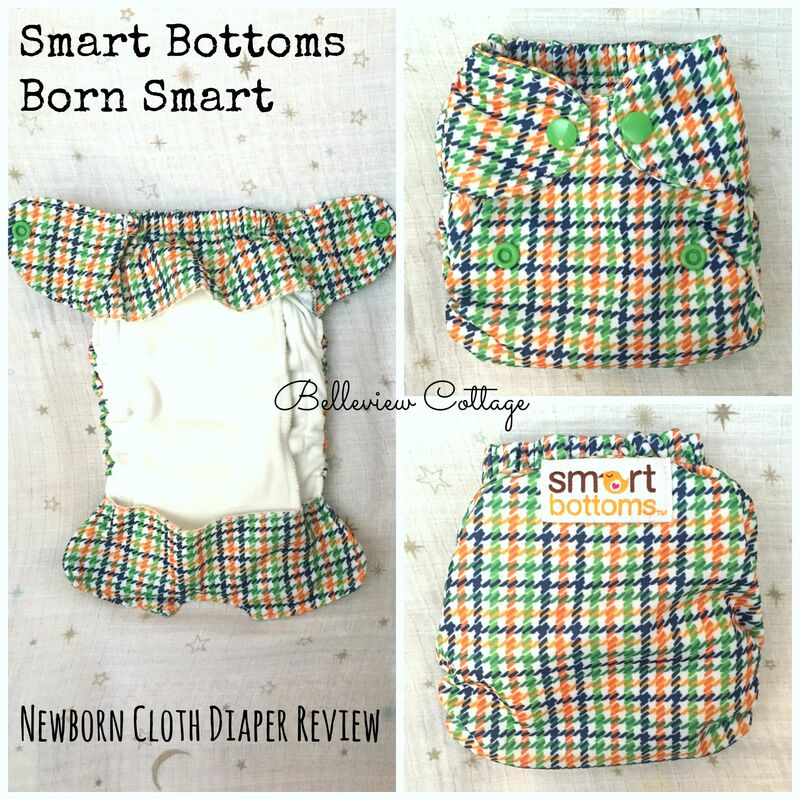 It is very similar to the Smart Bottoms Born Smart in size, fit, and features. The Simplex’s cotton inner is not as soft as the Born Smart’s cotton inner. But the Simplex is more absorbent, so it wins over the Born Smart in my book. It also still fits my chunky 2.5 month old (whereas the Born Smart does not). The Simplex also comes with a hook & loop closure option, which makes middle-of-the-night changes easy peasy. I don’t have one of these diapers in hook & loop, so I am curious how well Blueberry’s hook & loop holds up over time. If you have an opinion, please comment below! Bottom Line: The Teeny Fit is an awesome but expensive newborn diaper. The main drawback is the fact that it does not have a snap-down or cut-out for the umbilical cord stump. 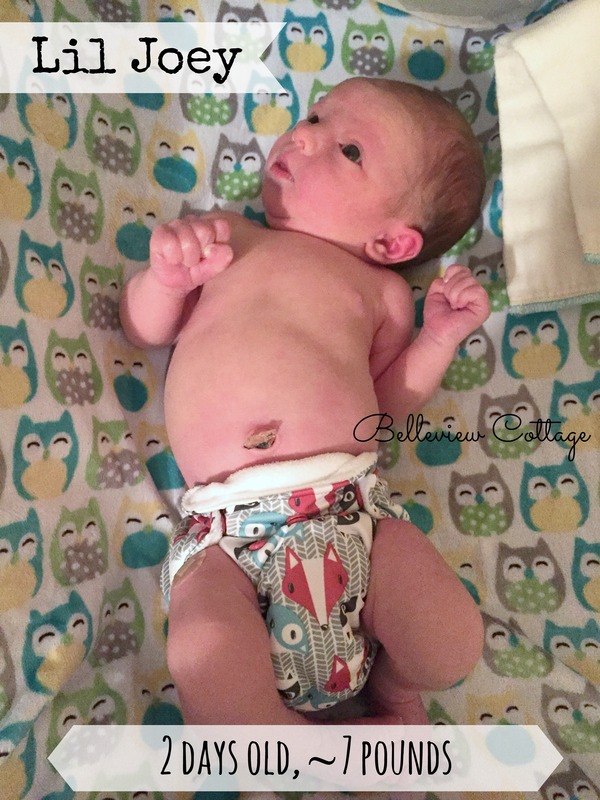 Smaller babies will not be able to wear this diaper until their cord stump falls off. I paired the Rumparooz newborn cover with Osocozy Organic Bamboo Prefolds ($20 for a 6-pack = $3.33 each). The idea behind prefolds and covers is that you can re-use the cover for a few diaper changes (as long as the pee/poo is contained in the prefold and does not get on the cover. If the cover gets a little bit wet from pee, it can be wiped out and set aside to dry while you use another cover. We are nearly 3 months in to our cloth diapering journey, and I still haven’t mastered the various prefold “folds,” even with the ease of using snappis to secure the diaper. So, I usually end up pad-folding the prefold (folding it into a long narrow rectangle), and laying it inside the cover. This is nice and easy, but the newborn poo gets onto the cover almost every time, which defeats the purpose of covers and prefolds (re-using the cover multiple times). I LOVE the absorbency of the prefolds, however. 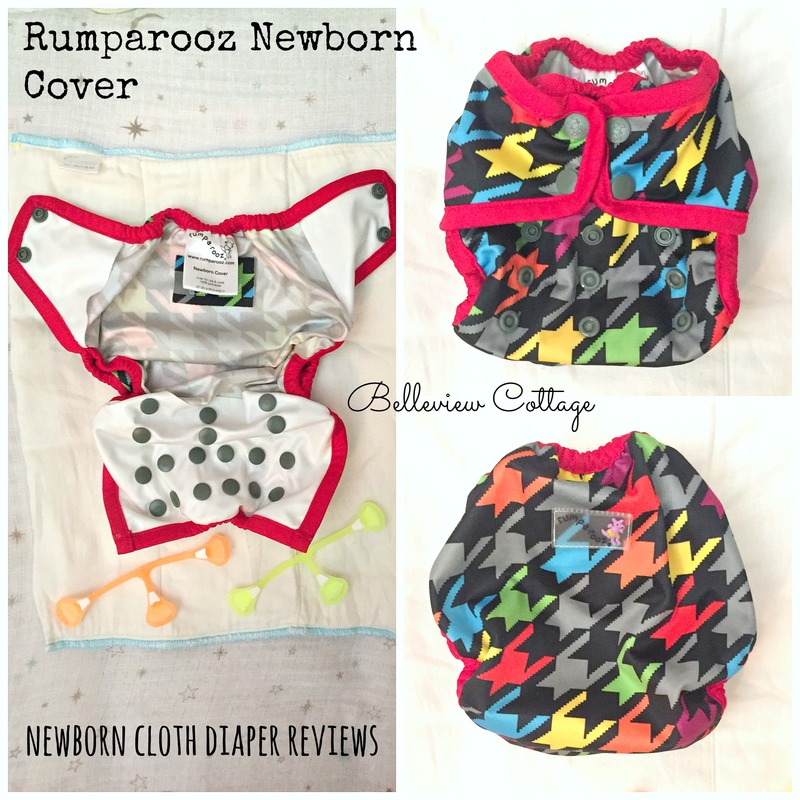 The Rumparooz cover with a prefold has been our only bulletproof newborn diaper when it comes to absorbency. My son has never out-peed this combination. Bottom Line: The Rumparooz cover with prefolds is an excellent option for heavy wetters, and for naps and long sleep periods. It is also extremely economical. To be honest, though, I hate how bulky it is under clothes (when baby is tiny). 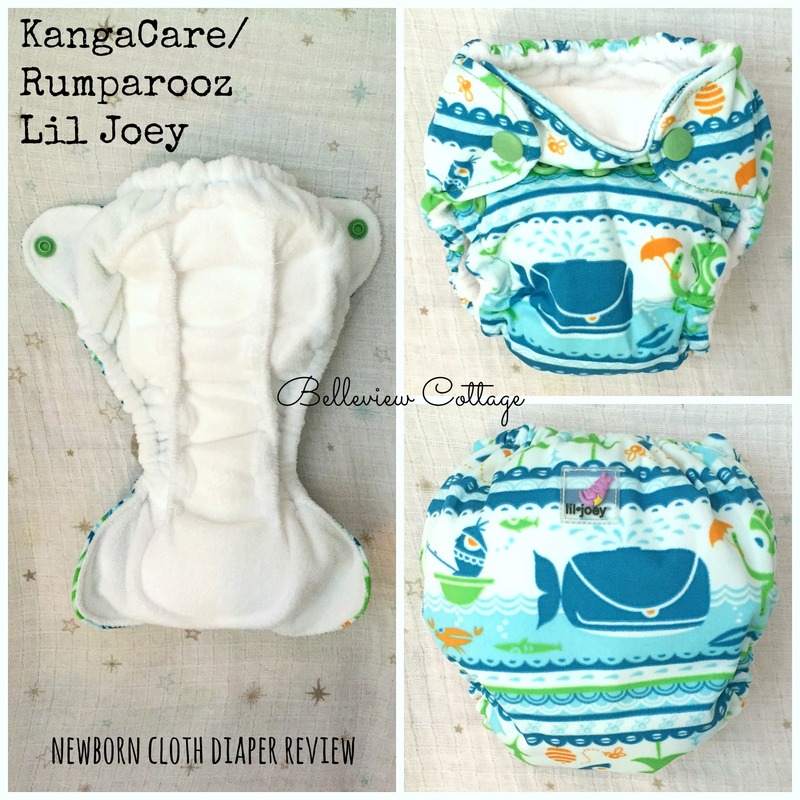 I do recommend prefolds and covers for those looking to save money by cloth diapering, and those who value performance (absorbency) over ease of use. 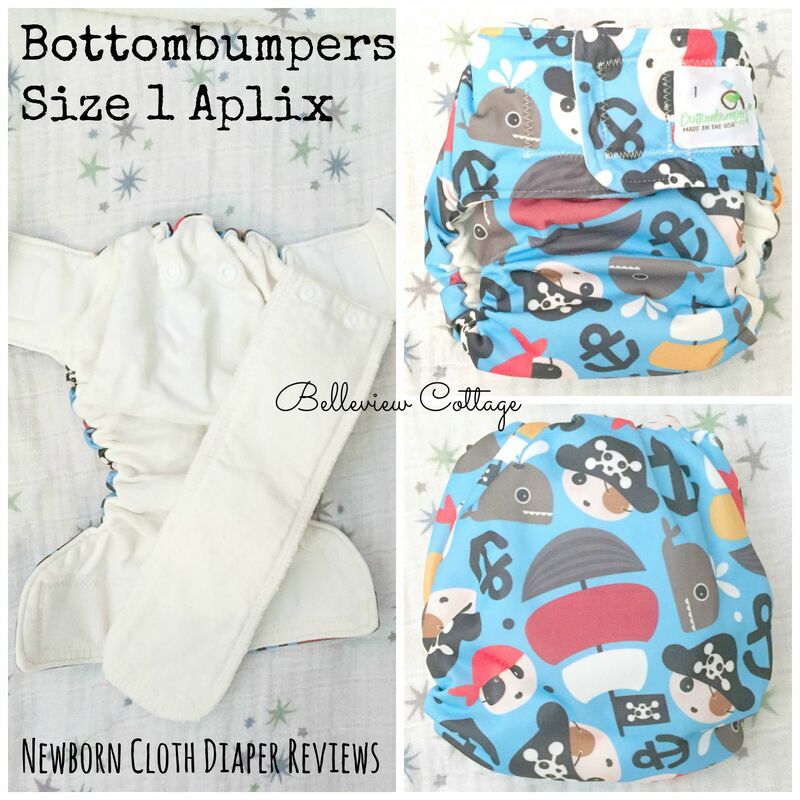 The Bottombumpers Size 1 aplix is my favorite newborn diaper! * Why? Because it’s the only one that I still really want to put on the little guy after 7 weeks old. I’m not worried that it will leak in only an hour. This diaper does have a few drawbacks, mainly bulkiness on a very tiny baby, and no umbilical cord snap-down. In the pic to the left, my little man’s umbilical cord stump was still attached. I thought the diaper was hitting right below the stump. But when I went to change him after an hour or two in this diaper, it had crept up and over the cord stump. This was no bueno, since moisture from the diaper got onto the cord stump (which needs to stay dry in order to heal and fall off). So I set these aside until the stump fell off. Nevertheless, these are my favorite for the following reasons…. Bottom Line: I love this diaper. The aplix is good quality, it is easy to use, fit is great, inner is organic cotton, AND it is absorbent. It will also fit baby for an extended period of time (up to 4 or 5 months, I’ve heard). The diaper is also made in the US! Combine these features with the $18.95 price (compared to Tots Bots at $21.95), and we have a winner! 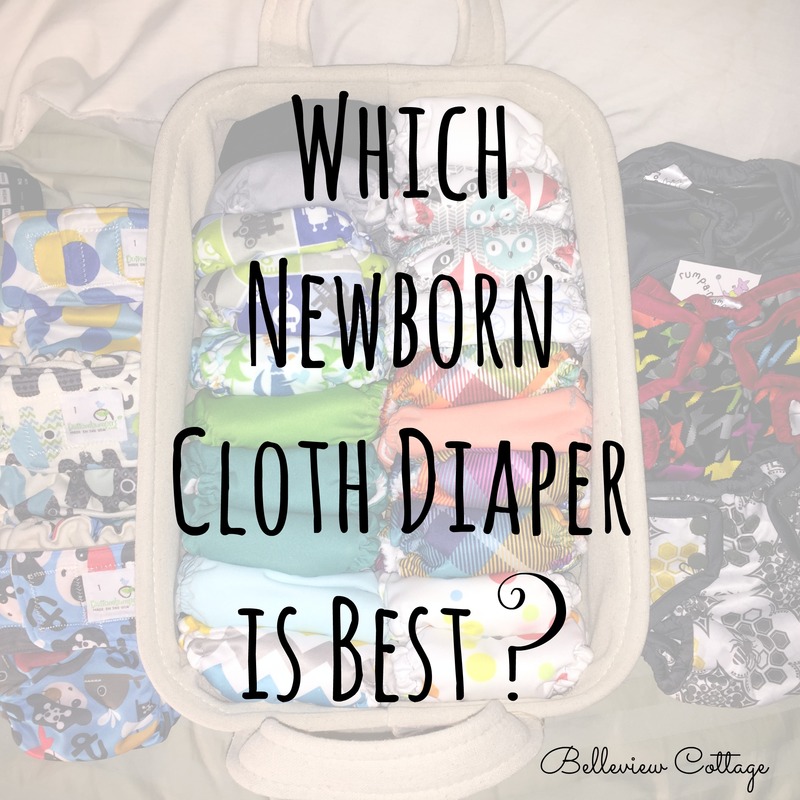 WHICH NEWBORN CLOTH DIAPER IS BEST? Prefolds and Rumparooz newborn cover for long naps, overnight, long trips in the car, etc. due to increased absorbency. Prefolds and covers will also work before the cord stump falls off. Bottombumpers Size 1 for day-to-day use. Velcro closure makes for a great, easy fit. Plenty absorbent for regular daytime use. 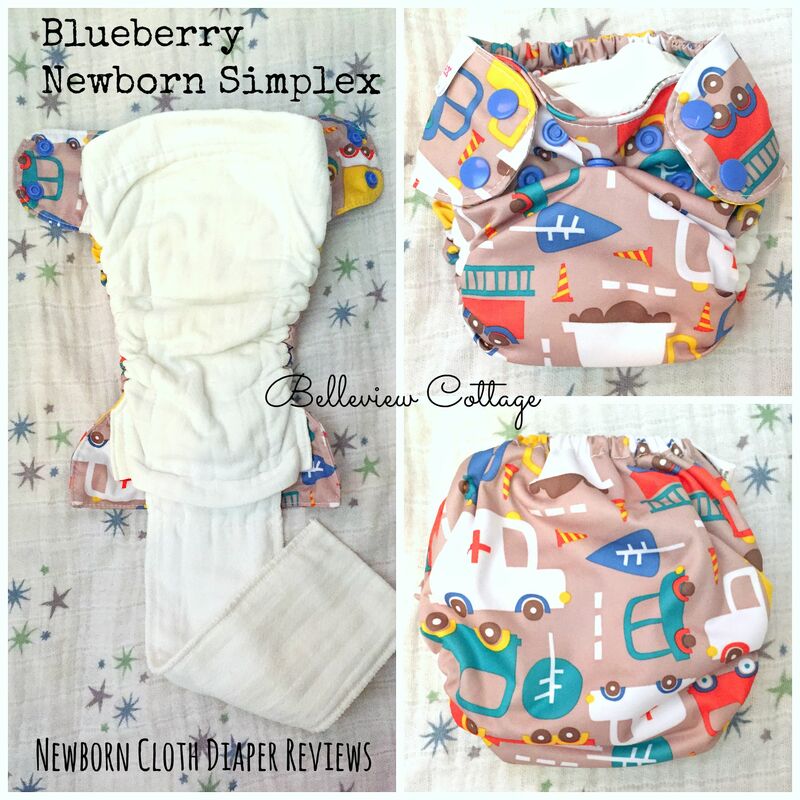 For a very tiny baby: Prefolds & covers and/or Blueberry Simplex newborn (6 pounds and up). As explained above, the most cost-effective way to do newborn diapers would be covers and prefolds. You can also buy used diapers to save money! Hopefully the above information will help you decide which newborn diaper(s) fit(s) your situation best! Please comment below if you have any questions or want to add your experience to the conversation! *I recently became a Bottombumpers delegate (brand rep). I wrote this post before becoming a delegate, so my opinions were not affected by that fact! Previous Post Create Instagram Wall Art! Next Post How to Save 80% at GAP! Tips and tricks for major savings. I’m still obsessed with looking at cute diapers and my youngest is 7.. LONG out of diapers! lol Great post! I just wanted to chime in that the tots bots teenie fits did fit my tiny guy when he came home at 6lbs! Also I agree that the newborn simplex are the bomb-diggity. I wish I would have tried BBs! Hi Morgan! Thanks so much for sharing! It helps to have input from different mamas since all babies are different. Good to know about the Tots Bots!